If we had to pick one word to describe the Adidas Power Perfect 3 it would be: Consistent. 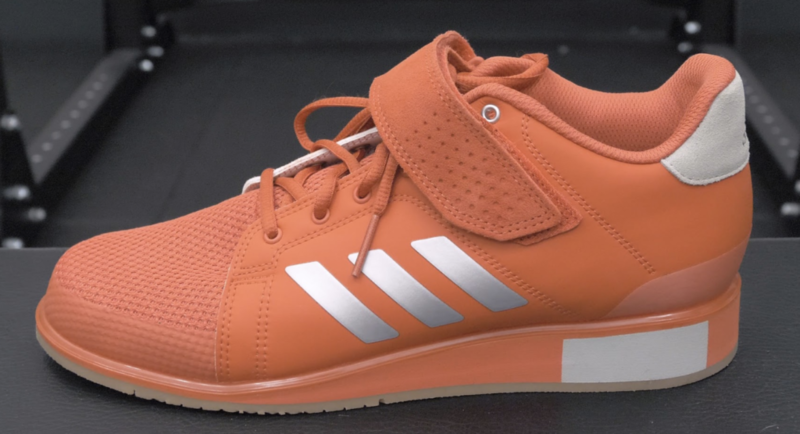 In early 2019, Adidas announced the Power Perfect 3 weightlifting shoe’s release with relatively no announcement. This model is an update to the previous Adidas Power Perfect 2 that debuted back in 2011. The Adidas Power Perfect 2 was often considered a mid-range weightlifting shoe, and with more models on the market than ever, we were curious if the Power Perfect 3 would compare to the market’s best weightlifting shoes. In this review, we reviewed the Adidas Power Perfect 3’s construction, performance, stability, durability, and price. One thing we can say for sure — the Adidas Power Perfect 3’s construction seems heavy and durable, so this shoe should last for a long duration of time. Sturdy and durable construction throughout the full shoe. Standard weightlifting shoe features: Single strap, .75″ heel, and reinforced heel cup. The outer construction on the Adidas Power Perfect 3 is composed of a few different materials. From the base of the toes to the heel there’s a synthetic construction that feels very similar to the Adidas Powerlift 3.1. 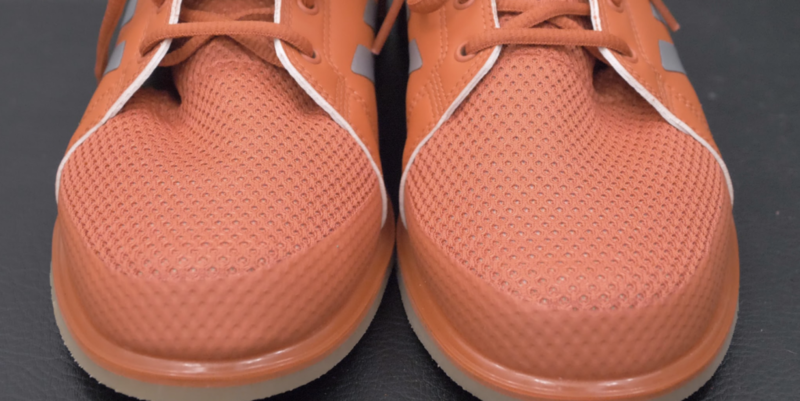 The portion with the synthetic upper has a thicker build to it and is definitely on the heavier side of materials (in respects to thickness) for weightlifting shoes. There is double stitching throughout the entire upper construction and an additional leather slip on the heel. The forefoot and the tongue are made with a breathable mesh, and the tongue’s construction is slightly on the thicker side for weightlifting shoe tongues. At the bottom of the toe, there’s an additional layer of synthetic material to prevent early wear and tear and friction, which is a good sign for durability. There are six metal eyelets that run up the mid-foot of the Power Perfect 3. The mid-foot construction for this shoe is classified as “derby”, which means each side of the shoe is designed specifically to hold the foot locked in. To facilitate the derby construction, the eyelets fall on top of the vamp of the Power Perfect 3 and bring the sides closer together when laced tightly. The strap is thick and made of leather with double stitching throughout. The strap falls just below the sixth eyelet and doesn’t have a ton of overlap when pulled completely tight. The effective heel height of the Power Perfect 3 stands at .75″ and offers a high-density EVA foam construction. This heel is extremely similar in construction compared to the 2011 Adidas Power Perfect 2 model. One thing that I liked about this shoe’s heel is that it utilizes a strong heel cup to provide support. There’s an additional cup that sits above the lifted heel, which creates a “hugging” feeling around the heel. The midsole is composed of a die-cut wedge, which is the natural slope present in the photo above. This construction feature is used to provide foot support and create a “natural” feeling from the toe to the heel’s lift. The outsole is composed of a thick and stiff rubber material, and has the Adiwear outsole. The Adiwear outsole is also used in the Adidas Powerlift 4. The Adidas Power Perfect 3 performed exceptionally well across the board. 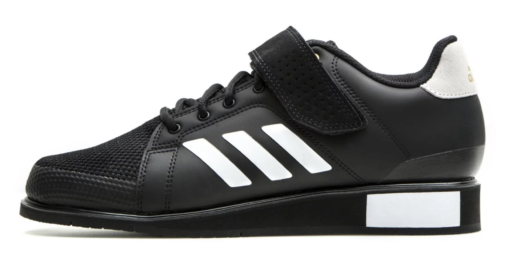 This shoe is exactly what you think of when you think about your “standard” weightlifting shoe. The high-density EVA foam heel did a great job at resisting compression, while also providing platform feedback. In addition, the .75″ heel provided a nice consistent feeling that most are used to when using weightlifting shoes (there’s no adjusting to a lower or 1″ heel). To test the Adidas Power Perfect 3, we paid close attention to three performance characteristics. First, we check the stability that the outsole and midsole provides to the overall foot. Second, we analyze the shoe’s feeling on the foot with how the strap, laces, and boot interact with one another. Lastly, the break in period — how long does it take to break these shoes in. After lifting in these shoes for about a month, the Adidas Power Perfect 3’s durability fits the bill vey well. There were no glaring issues with any form of shoe breakdown during our tests, and if anything, the shoe was a little tough to breakdown. The thicker outer construction, midsole, and outsole make this model one of the beefier and tough weightlifting shoes we’ve tried. For a pair of Adidas Power Perfect 3s, you can expect to pay around $130.00. In regards to other lifting shoes, this model is very competitively priced. It’s slightly more expensive that the Adidas Powerlift 4s, but it’s much less than some of the newer weightlifting models. If you want a fairly priced, durable pair of weightlifting shoes, then the Power Perfect 3s fit the bill pretty well. The Adidas Power Perfect 3 was the perfect culmination of sturdy and simple. This model offered a few construction changes from the previous Power Perfect 2 and we felt these changes provided more durability in this model. If you’re interested in a mid-range and “standard” weightlifting shoe, then the Power Perfect 3 might be your perfect match. Guy Greavette (look him up on youtube … he’s been a phenomenal lifter all his life and still lifts), runs “Viking Weightlifting Equipment” and he sold me a pair. I received them through the postal service three days ago and I absolutely love them!!! I’m 66 and just getting into the sport.